Teeth are discoloured and stained due to age, smoking, excessive coffee or tea, and the use of certain medication such as tetracycline. The desire for a brighter smile with “whiter” teeth, therefore, has become very sought after. This is simple to use and very cost effective. We will take impressions of your teeth, then make molds and custom-fitted trays which will be used to hold the tooth bleaching gel in your mouth. Instructions will be given about wearing them and they should be followed carefully. You will have to soak your teeth in the bleaching gel for only two hours per day. The results will be seen in one to two weeks and you can control the degree of “whiteness” that you desire. Upon achieving the desired result, you can stop the treatment and just reuse the system to freshen up or maintain the radiance of your teeth in the future. This procedure is carried out by our dental professional at the dental clinic using a LED lamp light in teeth bleaching. The process will take about 1-2 hours depending on the degree of ‘whiteness’ that you want to achieve. This is by far the fastest and most effective way of teeth whitening. 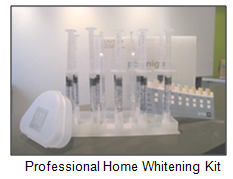 Bondi Dental uses top quality LED lamp and teeth whitening gel from the USA which are guaranteed safe and effective. Gum protection and gel are also used to minimize sensitivity during and after the procedure. Results are spectacular!